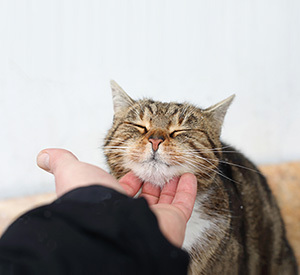 It’s an age old mystery – why do cats purr? What are they trying to tell us? Scientists still don’t fully understand all aspects of the mechanisms, or system of parts that work together, and produce purring and all its’ variations. However, we’ve got some interesting scientific facts to help us understand some key aspects about purring. Domestic cats, cheetahs, pumas, ocelots, servals, and lynxes all purr. Lions, tigers, leopards, and jaguars cannot purr. It is believed that the ability to purr may be related to the structure of the larynx or voice box. Cats who can purr have flexible bones that support their voice box and have a shorter larynx than cats who cannot purr. What Do My Cat’s Purrs Mean? In general, cats purr to communicate their presence and/or emotional state to another cat or person. For kittens, the meaning of purring changes as they grow older. Adult cats’ purrs show how they are feeling. They may purr when content, either when they are alone or when they are with someone. This purr is pleasant or melodious. Often adult cats also show signs of happiness by kneading or bunting. They will act this way when they’re with a favorite person or animal. If they are anxious or trying to appease a dominant cat, cats may purr at a higher pitch in a tight body posture. This purr may lessen tension for cats like nail biting, whistling, or a tight smile does for some people. Vibrations start and the nerves send this vibration to the larynx, the opening to the windpipe where the vocal cords are, and diaphragm. This causes a change in the tension in cats’ voice boxes (glottis) in a repeatable pattern or sequence. When the cat inhales and exhales, air moves in and out across the voice box, and creates the purring sound. Cats’ purrs produce a sound every 30-40 milliseconds and lasts for 10-15 milliseconds. So, they can produce about 250 sounds per second! Purrs change in volume, length, and frequency according to their state of mind. Humans may or may not hear all the sounds cats make because our hearing is not as sensitive or sharp, but other cats do. Sick or injured cats may purr at different frequencies to help heal themselves to varying effects.